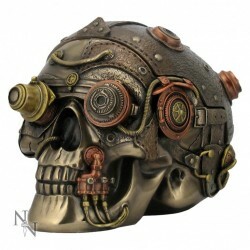 Futuristic Robot Skull Bronze in a Steampunk theme. Very detailed. Top lifts off to reveal a storage area. It's not obvious the skull ornament is a box at all and so makes an ideal secret hiding place for valuable trinkets. Solid Cold cast bronze resin for a heavyweight skull.